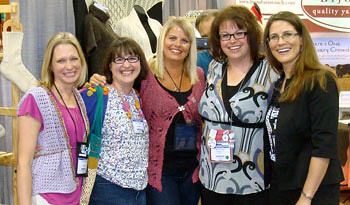 Kristin Omdahl, one of my favorite crochet designers, will be reviewing Little Crochet today. Kristin is the author of several books, Crochet So Fine being my favorite–and she’s also the crochet expert on Knitting Daily TV. I met Kristin in June at TNNA (the yarn industry’s trade show) where we enjoyed quite a few belly laughs at a designer dinner. Kristin is such a prolific designer, and I love the logic that she works into her designs. I had the pleasure of crocheting her Sprout Shawlette and I loved how it was mathematical and intuitive at the same time. Kristin is such a prolific designer, doing books, magazine work, DVDs and more, but what I love most about her is that she is a warm, friendly person. Here we are- Ellen, me, Kristin, Marly and Simona. Head over to Kristin’s blog to read her review of Little Crochet.